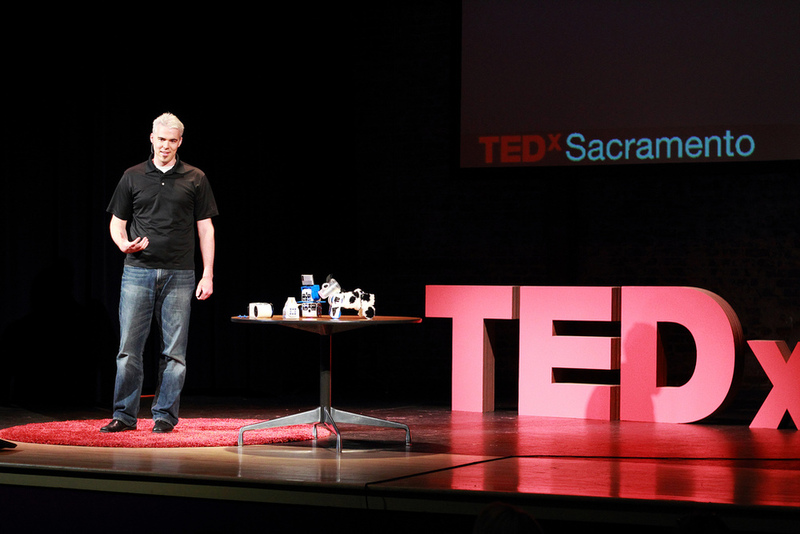 Graham Ryland, robot visionary and president of Barobo, Inc.
Graham Ryland, a former TEDxSacramento speaker, is taking his idea to the next level. Ryland, founded an educational robotics startup, Barobo Inc., in 2010. Since its creation, the entrepreneur has been actively working to help inspire children in the subjects of math and science through robotics. He recently launched a Kickstarter campaign to accomplish this goal. With the community’s support, Ryland was able to surpass his fundraising goal of $40,000 and was awarded $45,792 to launch his educational campaign. Lucky for us, Graham took some time out of his busy schedule to answer a few questions about his project and what the future holds for robotics. Were you surprised by the support you have received for your idea? It's pretty easy for most people to get excited about robots, so what I'm most surprised by is when people use our robots to do some amazing things, like create a music video, or walking robot that we hadn't thought was possible! How do robots inspire your creativity? When I was eight I watched an MIT Leg Lab robot do a front flip on PBS and it blew my mind... I was totally hooked! If you're going to inspire kids to get a degree in a STEM (Science, Technology, Engineering and Math) subject it's got to happen in high school or better yet middle school. Robots are a powerful tool to do that, so I've poured the last three years of my life into tearing down the barriers, like programming. What would you recommend to a student who wants to enter your field? My "field" seems to be constantly shifting. I got a master's degree in Mechanical Engineering, but I'd consider myself an entrepreneur. I'm constantly learning and stretching myself, so my recommendation would be to get a degree in engineering, but really focus on honing your process of learning because you'll need to advance and adapt throughout your entire career, no matter you do, to be successful. Why is it called a Linkbot? What inspired the name? Our robots are modular and snap together with each other, so we thought Link-bot made sense because they link together. Our robots also link together wirelessly, separate from a computer. As your company continues to grow, what do you hope to accomplish with the Linkbot? I want to inspire kids to go into STEM careers the same way that I was inspired by robots. Do you hope your robots will be used in classrooms as part of the curriculum? We've partnered with UC Davis and an organization called RobotAppStore who have developed curriculum for our robots and we're in 30 classrooms in California, really exciting times! Graham Ryland: "Robots Belong in the Classroom"